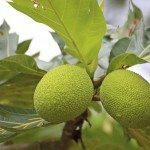 What is the optimal temperature for breadfruit? The article refers to "warmer garden" and "tropical". What does that mean in degrees Celsius? What is the upper limit? I note from several articles that plenty of air around the trees is best, to reduce the chance of fungus and other pathogens. Is this because the trade winds were part of the original environment of these trees? I suspect that a greenhouse would be required in high latitudes. Breadfruit is an equatorial lowland species. It is ultra-tropical, requiring a temperature range of 16–38 °C (61–100 °F) and an annual rainfall of 200–250 cm (80–100 in). It would not be suitable for Poland or for a greenhouse, they grow to a height of over 20 meters.